Maintaining our reputation for hard work, quality workmanship and service is more than a passion, it's a family tradition for over 50 years. In 1967, Ed Seguin bought his first truck after working as a miner and operating a beef cattle farm with the dedicated help of his family. Soon afterward, Ed along with his wife Jeanne-d’Arc and their four sons started paving and landscaping without anything more then rakes, shovels and a wheel barrel. In 1982, Ed Seguin & Sons Trucking and Paving Ltd. became incorporated. In 1992, two of the sons, Pierre and Maurice, became partners in the company while Claude and Rick pursued other careers and then later joined forces to start a mining contracting company now known as SCR Mining and Tunnelling. Having started working at a young age, all four brothers quickly acquired valuable experience and learned important lessons of business while building for themselves a solid reputation of being hard working and honest businessmen. They knew the secret to success was to be fair with their clients and to deliver only the highest quality of workmanship and service. The brothers always maintained a close relationship and in 2009, they joined forces again to be the proud owners of a newly formed family operated company, while Ed and Jeanne D’Arc started enjoying a well deserved retirement. With their combined strength, synergies, persistence and perseverance, the brothers re-invested into the company to make it what it has become today. The commitment to excellence continues. 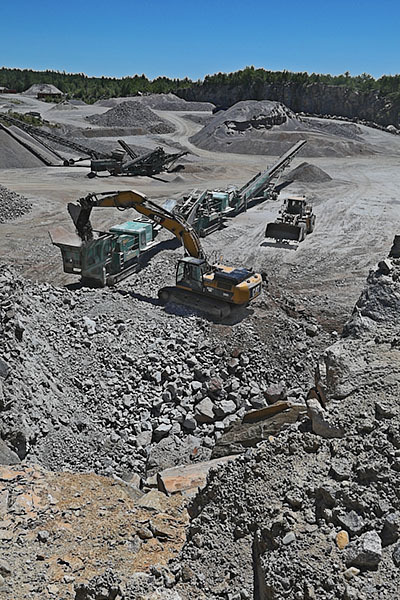 One of the largest and most diversified suppliers in the area, the company owns and operates multiple rock quarries, sand pits, a new fleet and state of the art equipment. Being a high volume supplier of construction aggregate allows us to complete projects at lower costs than our competitors. Not only do we produce the materials in bulk, but we also deliver and install to engineered specifications. Having such a strong history of quality workmanship in asphalt, we have become experts in excavation, water management, aggregates and fine grading. These attributes are the building blocks of construction which is why we are able to successfully adapt and expand our construction services to site work, road building, infrastructure, drainage, septic systems, and more. With the support of SCR Mining and Tunnelling, Ed Seguin and Sons have broadened their services and successfully participated in various mining projects. These include developing and maintaining mine sites, bulk sampling, custom portable crushing solutions and more. This Metis family-founded, owned and operated company continually demonstrates pride in their work and appreciation of their clients. With over 50 years of experience, and now with a third generation continuing the legacy, it is evident that Ed Seguin & Sons is built upon a solid foundation and is here to stay into the future. Today, we’re on a clear path to success… continually adapting by embracing new technologies, training our people and continually evolving as an organization to provide effective solutions to your projects. "Over the last four years, the service, quality and communication has been very satisfactory. The level of safety is good, and cleanliness/housekeeping of job sites is consistent. All trades that occupy the area maintain a level of pride in their workplace. Pierre Jr. is a very calm and organized individual who has great people skills and maintains a positive attitude with his crews and customers. I see a bright future in his field of expertise." Steve Gauvreau, PresidentS & A Gauvreau Properties Inc.
"The project was pre-planned weeks before and they arrived on the planned date and completed the project quicker than scheduled. The overall quality of the work was as expected, if not better. The head office communication, information and test reports provided were swift and efficient. Overall, the project went smoothly and I commend the staff of Ed Seguin & Sons of their professionalism and work ethic and will refer them to anyone who is considering their services." "It is an absolute pleasure to work with Linda and Pierre. They are amazing people. We are very happy with the work performed. They have a great team." "Ed Seguin & Sons have gone above and beyond in every way possible tohelp NPL in our 2018 season. We appreciate all they did and look forward to doing business with them in 2019." Bob Hutson, SuperintendentNPL Canada Lrtd.